June 10, 2015 – The Tropospheric Emissions: Monitoring of Pollution (TEMPO) instrument, developed by Ball Aerospace & Technologies Corp. is headed toward its Critical Design Review this month following an earlier milestone that included Preliminary Design Review (PDR). Ball is now well into the fabrication of the instrument following the successful PDR and a confirmation review. 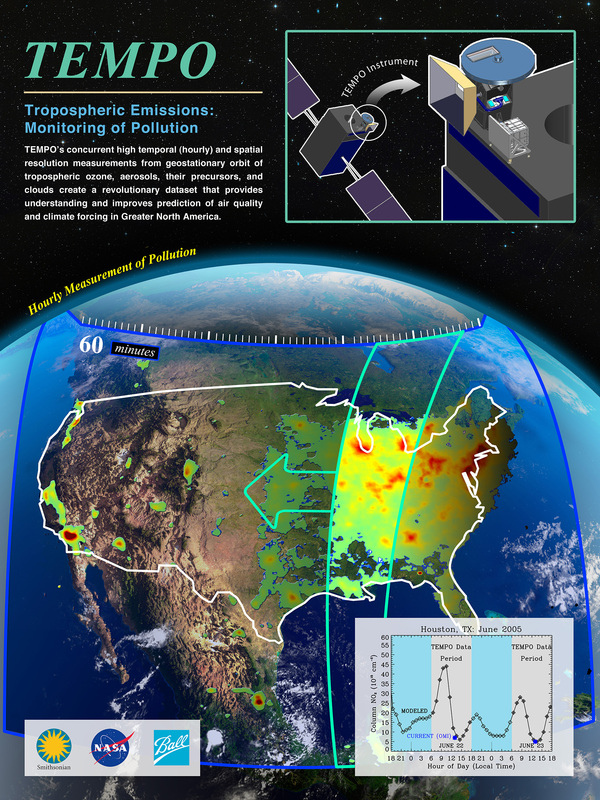 TEMPO, an air quality sensor that will provide hourly monitoring of pollution across North America, is the first NASA Earth Venture Instrument mission with a UV-visible air quality spectrometer to be placed in geostationary orbit. The TEMPO instrument is designed to make accurate observations of atmospheric pollution with high spatial and temporal resolution over North America, from Mexico City to the Canadian oil sands, and from the Atlantic to the Pacific. TEMPO will observe Earth’s atmosphere in ultraviolet and visible wavelengths to determine concentrations of many key atmospheric pollutants, such as ozone, nitrogen dioxide, and formaldehyde. TEMPO will share a ride on a yet unidentified commercial satellite as a hosted payload. In addition to TEMPO, Ball Aerospace is jointly developing a similar geostationary ultraviolet visible spectrometer, the Geostationary Environment Monitoring Spectrometer (GEMS), with the Korea Aerospace Research Institute (KARI), South Korea.